An entire family left their long-time claimed territory, leaving one daughter behind. I thought the vast territory had become hers. For several months, I would find her all alone. And then one day, there were two newcomers with her — both males! I could tell that she was apprehensive about them for the first little while after they appeared. She kept a squinted, wary eye on them as they loitered around fairly close to each other until dusk darkened the sky and enveloped the landscape. She was assessing them, and they her. Dusk is when she’d usually head off trekking alone, and soon I watched as three of them went off together, not with complete confidence in each other as one would expect in an established family, but they were figuring each other out, and figuring out their relationships, through darting eye-glances: coyotes communicate visually and everything they did sent a message and was interpreted as a message. I watched these three for the next few weeks as they became more obviously trusting and comfortable with each other. Right from the start, though, she showed a preference for the dark-eyed fella: he was the obvious dominant of the two, and maybe this had everything to do with her choice.
. . . to ‘her chosen fella’ taking charge and leading the chorus when sirens sounded. Note that, although she appeared to have “chosen” her fella early on, the “possessive display” continues, and you’ll see this at the end of these two howling videos. It wasn’t long before I observed an all-out, no-holds-barred play session: they were in a sand-pit a long distance off and it was dark, but I got this photo above, showing them playing as coyotes do when they like each other: chasing, wrestling, and play-beating up one another in a teasing sort of way. And then, within only a few days of that out-and-out play, the pair was gone. They are now gone and have been for weeks. So, I guess the lady of the house’s new beau came in and swept her off her feet and they loped away into the sunset together to hopefully live happily ever after — isn’t that how these stories are supposed to go? I wonder if I’ll see them again. Since their departure, I’ve only seen the extra-male a few times: the beautiful pale blue-eyed fellow below. But now he, too is gone. The field has been totally vacant for weeks. The family that left had been there twelve full years I’m told by a fellow observer who knew the Dad from the time he was a mere pup. That fellow observer ceased appearing because the coyotes had. So there’s a big void there right now. I suppose my assumption that the vast territory had become “hers” is incorrect. It’s a coyote no-mans land right now. Twelve years ago, before this family claimed it as their own, there had been a territorial battle between two families here. I was told that one of the families was so vengeful that it went after and slaughtered the pups of the rival family. Then all families disappeared and only one youngster remained there. He became the owner for the next twelve years until last fall. This story came from my fellow observer who, I can verify, has been an astute and accurate observer and could even identify individual coyotes in the dark (which I still have not mastered). There is no reason not to believe the story. I’m relating it to show just how intense and brutal territorial battles can get: that the battles are fierce shows just how important the land is to coyotes for their survival. I’m hoping someone comes back soon: it might be the old family, it might be this recently formed pair, it might be the extra-male, or it might be someone never seen before: vacant niches tend to be filled, so let’s see. Of interest to me, as noted in my very last posting, is that observable coyote activity is way down in almost all the territories I study, and may be due to the upcoming pupping season. On this outing, their tight bond manifests itself through waiting for, watching out for, communicating with, searching for and constant eye-contact with each other. Dawn was breaking as I entered a park to hear faint distressed barking in the distance. It was the kind of coyote barking that occurs when they’ve been chased by a dog. It was the male of a pair who was belting out his displeasure. I hurried until I was right next to the sound and recorded it, though I could see no coyote. When it stopped I followed the path to find the male up ahead of me. He trotted along, turning to look at me once and then climbed an embankment where he looked around. I knew he was either looking for the dogs or for his mate. After a few minutes, he trotted on and then dashed into the grasses to this heartwarming scene, in photo below. She had probably been with him when the dog incident occurred. He had stayed put and howled to keep attention on himself while she made her getaway. Together after being separated by a dog, after which *he* howled in order to draw attention to himself and away from *her* so she could slither away from danger. Here they are curled up together in the grass for a moment. After their short greeting, they walked on, each hunting alone several hundred feet apart. They kept checking on each other and then headed up the hill where I was standing. The male came up and waited, but the female saw me and preferred taking the long way around me. He then followed her, and they both trotted off together on the path. I took a circuitous route so as not to interfere. When I next saw them they were still trotting along together. That’s when a dog darted at them and the male gave chase. The owner remembered that it’s best to keep dogs leashed in a coyote area. Then I lost sight of the male, but I followed the female as she foraged in tall grasses. She did so for about 20 minutes on a quiet, untraversed area of the park, but she didn’t catch anything. At the end of this stretch of her hunting, both she and I looked down to see the male waiting calmly for her on a rock — looking around for her. She began heading down the hill towards him when suddenly he bolted up, saw and assessed what was coming from the other direction and fled: it was a large golden retriever who had caught sight of the coyote and was coming after it. The coyote was fast, and I let the owner know what was going on. So many dog owners are totally oblivious to what their dogs are doing. The dog and owner then went the other way. Now, the female was out of sight. The male doubled around and headed back to where I had last seen the two coyotes together. He sniffed around and marked the area. People were passing, so he slithered under a bush until all was clear and then headed out again on the trail. Just then a runner appeared with his two dogs. The dogs did not see the coyote, but the coyote saw the dogs, and the owner saw the coyote. The owner leashed one of his dogs, turned and went the other way. Yay! More and more dog-walkers are learning to move away from the coyotes! The coyote just stood and watched him go. Maybe he was surprised that the dogs hadn’t come after him. Calling it a day: too much dog interference, and *she* is not to be found. So the coyote turned and headed down a grassy hill into the brush. I had seen a lot of psychological contact and togetherness in this mated coyote pair, but also I had seen plenty of dog intrusions. About half an hour later a siren sounded and I recorded the male responding to it from the brush he had entered. Again, I didn’t see him as he howled. Later on, I had one more glimpse of the male on the other side of the park before he descended, again, into the brush, this time for the duration of the day. As the light of day wanes, I’m poking around in a park in San Francisco when a coyote darts out of the bushes and rushes past me. I drop what I’m doing, and lift my camera — I’m happiest when there are coyotes around to observe. He hunts in tall grasses, patiently waiting with his snout close to the ground. Suddenly he darts to the side and pounces. That was his first vole of the evening. He’ll soon catch another in those tall grasses. Voles are small and two are only a snack. The grasses are super tall right now and coyotes are hard to detect in them. From a distance all one might see — which gives their presence away — is the tippy-tops of the tall grasses erratically wiggling more than the rest of the wind-blown grasses. He trots deliberately over to another area where he pokes around in several of the openings which he himself might have created in the dense tangle of thick, foot-deep weeds which carpet that part of a hill. He spends time with each opening, sticking his snout in, listening, and moving the stalks aside. After examining several openings in this manner without success, he turns around and heads towards where I first encountered him. It’s a slow walk, with casual hunting stops along the way, though he doesn’t catch anything else. En route, a distant siren sounds — or maybe it’s not so distant. Maybe it just sounds faint and distant because of the strong winds. He’s at the top of a hill and the wind is blowing strongly and in furious gusts. He begins howling. In the video the wind ruins the recording but the coyote is shown belting forth. Turn the sound way down to see the video — wind on a microphone is deafening so you’ll want to hear it at a low volume. Immediately, SHE, his mate, returns his calls.Soon there is back and forth communication: howling and yipping which to me is beautiful and and comforting, but which to others might be more readily described as eerie and disturbing. Today it is mostly drowned out and overpowered by the bursts of wind on top of the hill. After several minutes of howling, with snout whipping up and around like the wind itself, he stops and looks around to assess his surroundings for safety, and then heads down the hill and towards her. He seems to know exactly where to find her — he located her by her return calls. But on the way he suddenly stops, frozen in place for a few minutes, and looks around, straining all of his senses: it appears that he has caught her scent sooner than expected. Instead of waiting from her calling spot in the under-cover for him to arrive, she has set out on her own — maybe to intercept him. But they are not on the same path, so if he had relied on vision alone, he would have missed her. Using all of his senses, he detects her presence nearby and then sees her several hundred feet away. They stand very still and stare at each other for what seems an eternity but is only a few seconds. Then he relaxes, turns around and walks past some bushes in order to meet up with her. Their rendezvous and greeting, with variations, is standard for coyotes. He slowly approaches her, and as he gets close, his posture is upright and tall. She immediately falls on her back deferentially. Thus begins their greeting ritual. He smells her carefully — maybe he can tell what she has been up to? When she knows he’s satisfied, she gets up carefully and then she begins grooming him — licking and pulling ticks off his face and affectionately pulling his ear. As she’s grooming she stands next to him, and then she extends her neck over his — he allows it: these two are well matched. The major block of her days are spent with pups. He is the one who has chosen the safest areas to keep the pups sequestered. His main duties, as displayed by his behaviors, are to patrol for safety and bring home food which he carries in his belly and then regurgitates for the pups. Safety is one of his chief concerns. He often even escorts/shadows her when she decides to go a-hunting. He does so to guard and protect her, but also to keep an eye on her! Young pups do not participate either in these rendezvous nor the treks which follow. The youngsters are tucked away carefully and left alone during these occasions. After several minutes of grooming, he steps aside and then he leads in my direction. She has become the shier of the two in the last few months — which she wasn’t at one time — and moves away and around me. His route, keeping his distance, is more in my direction. And this is when I decide to leave — I don’t want to get in their way. It’s getting dark and anyway, the camera will stop being able to process the light soon. These two coyotes, a father and a year-old daughter, were out walking together at dusk, in a thick fog, when a large English Setter up the path went after them. This caused the coyotes to split up, with the female running off and out of sight. The dog owners grabbed their dog and walked on. I watched the remaining coyote, the male, walk on and then head over to some grasses to wait for his walking companion. He waited and waited. Finally he stood up and walked to the crest of a hill where he strained his neck and lifted his head high looking in all directions for her. The crest of a hill is a good vantage point if you’re looking for someone. No luck. He then went down the hill a little ways, walking slowly, and did the same thing. He then turned and looked at me, and I understood. That he wanted to be with the other coyote, that they were companions who were fond of each other, was obvious. It was joyful to know and understand this, but sad to see the little fellow distressed by her absence and searching for her, but not finding her. In the past I’ve watched coyotes spend half an hour searching for each other after an unexpected encounter on a trail caused them to split up. Coyote family members are good “friends” — not too different from the way we humans are with our family members. They, like us, like being together and doing things together, and they’ll search for one another when they unexpectedly become separated. As in our human families, coyotes each have unique individual personalities and they form unique relationships among themselves which are often very affectionate and caring. Here, two yearling siblings are out exploring and hunting before meeting up with the adults of the family. I was able to watch the two for a couple of hours. During this time, each kept visually aware of where the other was and what the other was doing. They would separate for only short periods of time and short distances as they explored and hunted, and then they would look up and run towards each other. Besides simply liking each other, they seemed oddly dependent on each other for safety and security on this particular evening. In these grainy photos taken at twilight, the little female coyote, to the right, after yet again running towards her sibling, rubbed her head against him and then actually raised the front part of her body over his back and partially lay on him! 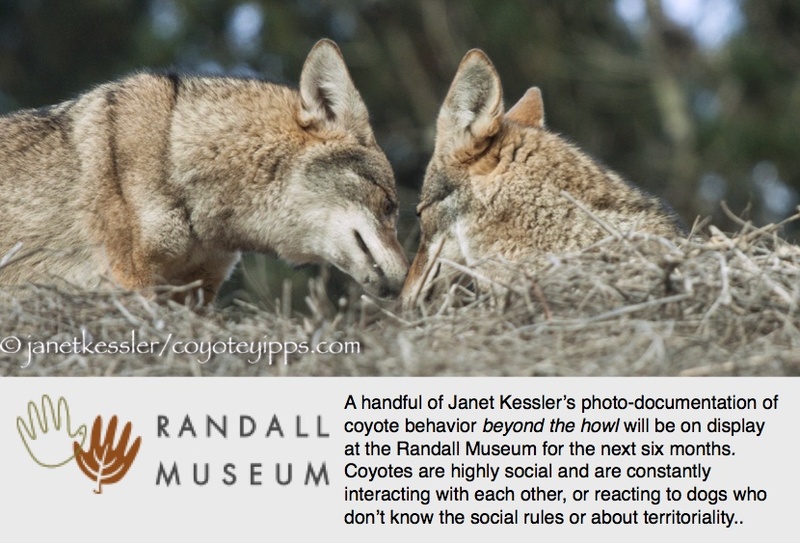 Togetherness and physical contact are characteristic of coyote family members. As she lay there draped over his body, she engaged in some tender grooming — looks like she was removing bugs from the back of his head — extending her contact with him and staying there for over a minute, and occasionally looking around before both slipped apart and again wandered a little ways apart from each other. It is again breeding season, when unattached coyotes look for partners who will become their lifelong mates. These two coyotes appear to be a new “couple” or “pair”, or at least they are headed in that direction. The male has been following around after the female, at a comfortable distance, without crowding her, and even looking disinterested at times, but always only a few paces away! The male is totally solicitous of the female, and ever so careful not to annoy or upset her. He watches for, and is alert to, any sign of displeasure from her. She is the queen. She, on the other hand, is much less interested in him, it seems. But she is his “chosen one”, and if she consents to his advances, they will become partners for life. Although I could not see the details because this occurred within a tree grove, there is enough information here to see that the full-sized, though only 8-month-old, pup approaches its father for food by sticking its snout into the father’s mouth. Apparently, the pup gets something because its attention is on the ground in the second photo, and it stays behind to “finish up” whatever Dad had given him in the third photo. At 8 months of age a pup does not need help from its father in getting food. However, giving the pup food tightens the strong bond which already exists and may keep the family together for a longer period of time.